iTunes library, as a database which contains all kinds of audio and video files you add to iTunes, is used to store and manage media files in iTunes. However, if your computer suddenly crashes, you buy a new computer, your iTunes corrupts, or you mistakenly lose the entire iTunes library, iMyFone TunesMate will help you to restore your entire iTunes library from unlimited iPhone, iPad and iPod in a smart way, including Music, Playlists, Movies, Music Videos, Home Videos, iTunes U, Audiobooks, Podcasts and TV Shows. Click "Transfer iDevice Media to iTunes" from the Home interface, and click “Start” button from the pop-up window to continue. 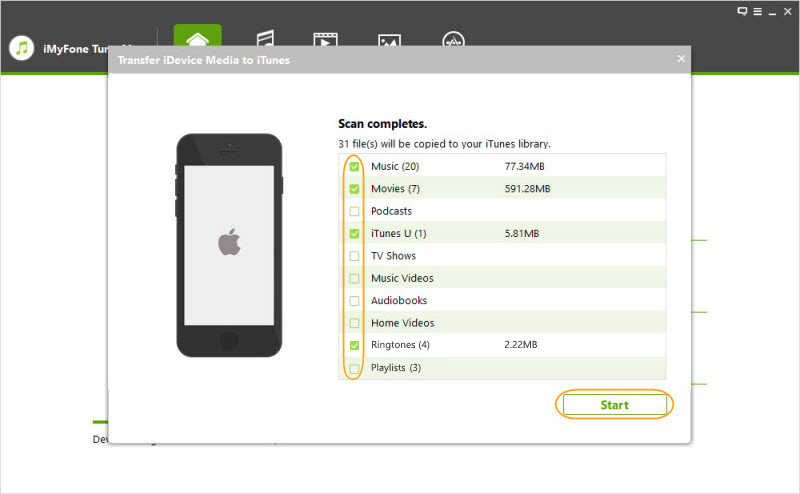 It will scan all the media files on your device which are not in iTunes library, and show them by list. All the media types will be checked by default. You can uncheck the types which you do not want to transfer. Then click "Start" button to begin the transfer process. Click "Complete" button from the pop-up window of "completes" to finish it. 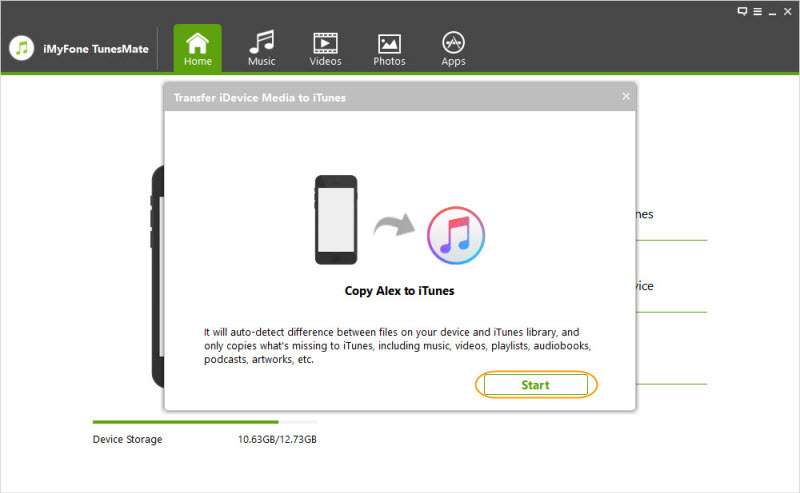 iTunes is the Apple's official tool to manage or store media files on your iPhone/iPad/iPod. But most Apple users do not dare to use the sync function on iTunes as it will cover the original data on iDevice. iMyFone TunesMate enables you to add various media files to your iDevice from iTunes library without erasing any original data. It also breaks iTunes limit to transfer iTunes media to different iDevices even with different Apple IDs. 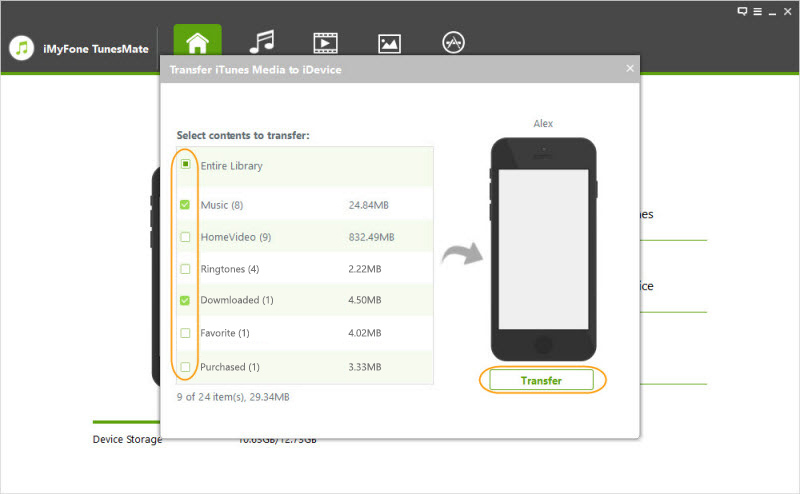 Step 2: Click "Transfer iTunes Media to iDevice" from the Home interface of TunesMate. It will scan all the media files in your iTunes library and show them in list. All the media types will be checked by default. You can uncheck the specific types you do not want to transfer to your device. Click "Transfer" button to begin the transfer process. Click "OK" button to finish it. Most Apple users enjoy taking or saving photos with iPhone/iPad/iPod touch to record their life or precious memories. Photos means a lot for them. It is a good choice to back up photos to computer locally in case of any accidental loss. 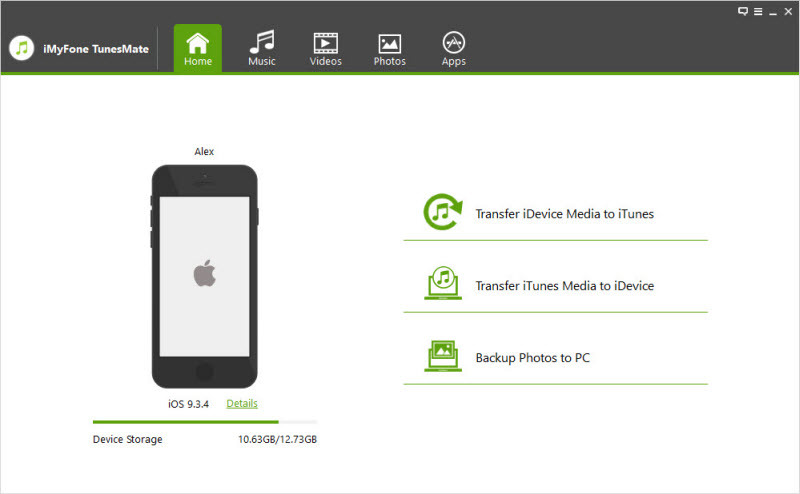 iMyFone TunesMate enables you to back up all your photos from iDevice to PC/Mac in 1-click. Launch iMyFone TunesMate on your computer and connect your iPhone/iPod/iPod touch with a USB cable. Click "Backup Photos to PC" from Home interface of TunesMate. 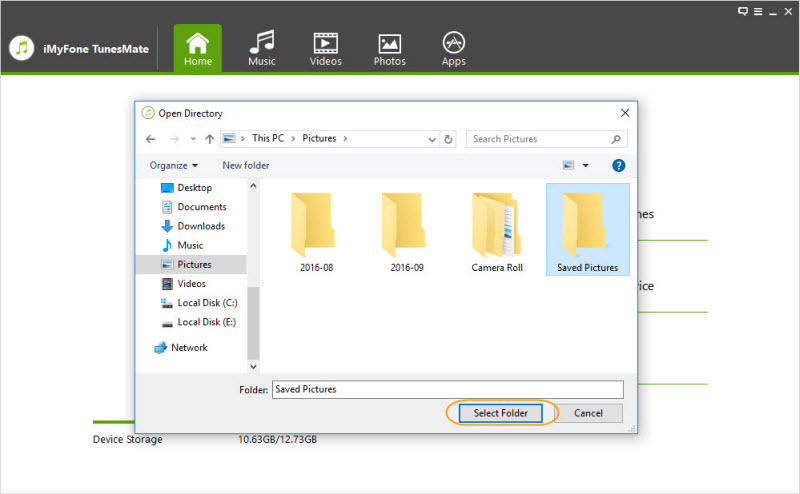 Browse and select a target folder to store the photos on computer from the pop-up window, and click "Select Folder" to start the backup process. Click "Backup Photos to Mac" from the Home interface of TunesMate. Browse and select a target folder for the photos, and click "Save" to start the backup process. A window will pop up to show you "Back up successfully". Click "Open Folder" to find the photo backup, or click "OK" to close the window.